The Department of Music at Southern Utah University is looking for participants for the Piano Monster Concert to be held at the Heritage Center Theatre on November 28, 2017 at 7 p.m. The Piano Monster Concert is a unique and exciting opportunity for participants with varying experience and age. 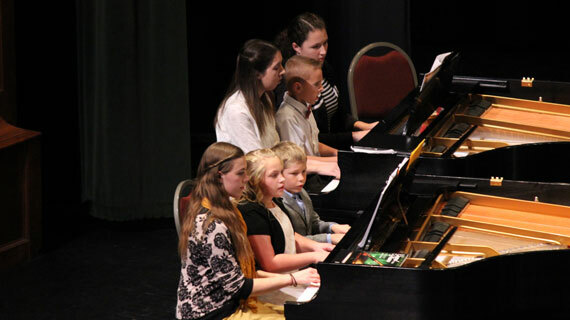 Dr. Lawrence Johnson, Chair of the Department of Music at SUU said, "The Piano Monster Concert provides an excellent opportunity for children of all ages to collaborate with many other piano students to perform in a professional venue with several pianos on stage! And the audience gets the chance to hear numerous combinations of duets, trios, quartets, octets, and even larger, that are not heard anywhere else! Great fun for all...a must see and hear!" Pianists of all ages and abilities are welcome to participate, including children, adults, and teachers. Two or three pianists will be playing at each piano and each piece will have varied difficulty. With multiple pianos on stage, this truly becomes a “Piano Monster”. Mary Anne Andersen, teacher, performer, and Adjunct Faculty at SUU, said, "What is nine pianos, one hundred players, and a drum set all on the same stage called? A piano orchestra, of course! See it the night of November 28, 2017 at the Heritage Center Theater. Hear one hundred players perform classical, pop, or jazz tunes, synchronized under the baton of a conductor. The youngest player will be 6 and the oldest? Don't ask. Just come and enjoy this ever-popular concert presented the week after Thanksgiving." Registration for this event is $5 per participant. All registrations must be completed by October 20, 2017. Additional rehearsals will be held during the weeks leading up to the concert. Attendance at these rehearsals is encouraged but not required. Participants should also plan on spending between $5.00 and $15.00 to purchase music (available through Cedar City Music and The Music Store in St. George or online). Applicants are welcome to play in as many groups as they like with no extra fee required.